Frio River Farm is 5,892 acres of highly productive black clay loam soil, with river and creek frontage and an exceptional water supply for over 2,580 acres of irrigated fields, that is an operating farm and ranch for sale in Uvalde County, Texas. 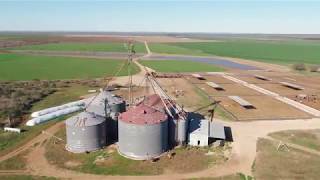 This is an impressive example of an expertly developed Texas farm and ranch with quality improvements and infrastructure, that is staffed to create an efficient operation that can easily be transferred to new ownership without any negative impact on the propertys productivity. A farm and ranch operation of this size and quality is truly a rare find and an amazing opportunity for the savvy operator or investor. The property has over five miles of Frio River frontage that forms the southern border of the property. It also has over five miles of both sides of wet weather Blanco Creek running down the eastern portion of the property. The creeks course has been left in its natural state, leaving it lined with native trees and brush. The creek drains into the Frio River on the Southeast corner of the property.